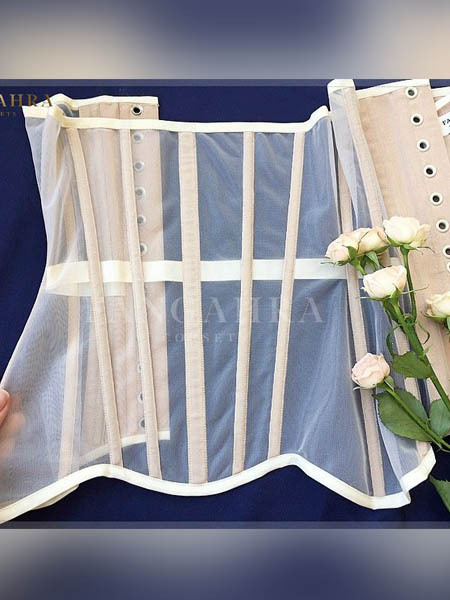 What are the differences between the authentic corset and the imitation, which corset shape is the best fit depending on the purpose, and also what to wear with it. The corsets are made of high-quality European and international materials. Our prices are a payment for quality, comfort and durability. Welcome to corsetry atelier’s website “Fangahra Corsets” dedicated to corsets and buying corsets! 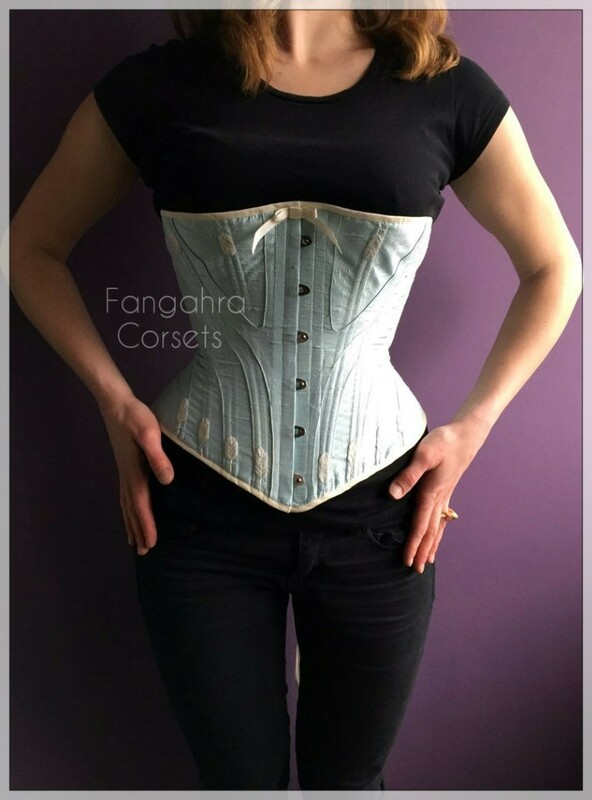 Here you can find a lot of information about authentic waist training corsets by сorsetiere Veronika Fangahra, you can also choose and buy the corset you liked online. Or may be you prefer to order the corset with your measurements. Find more details about our corsetry atelier on About Us page. The models are in stock right now. Find yours and purchase immediately – without having to order and wait. Get your corset as soon as possible! 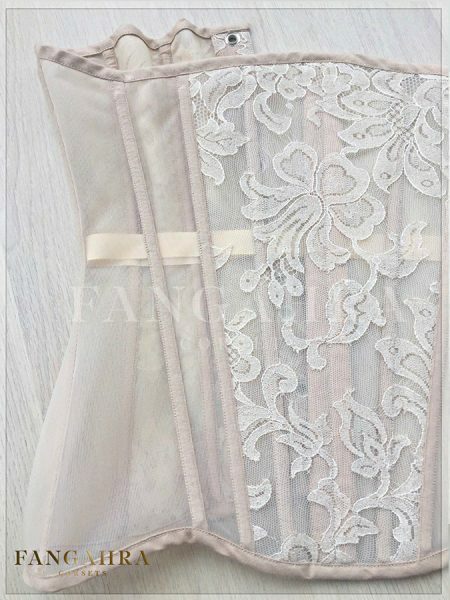 Transparent lingerie corset in beige color made of soft corset mesh. The self-fabric carriers and inserts at the back are made of silk coutil. The inserts at the hips increase the hips visually. 4 flatbed and 14 spiral steel bones. Waist reduction: 12-15 cm / 4,5 – 6 in. The corset is available for personal order. Mesh lingerie corset "Cappuccino". Made of soft chocolate colored corsetry net. In front decorated with beige french Chantilly lace. Lingerie corset "Beige Lily" is made of soft corset mesh. In the center covered with Italian beige lace. Self-fabric carriers and inserts at back made of natural cotton. Our customers in corset and without it. Find more testimonials on Review page and on our Instagram. The classical corset or overbust corset. It provides maximum support for the breasts, and emphasizes the elegance of female figure. It can be worn alone. It can be worn with jeans and a skirt. There are front-, back- and side-lacing corsets. Each type of lacing has its own advantages and disadvantages. For instance, the back-lacing corset is the best in figure slimming, but you’ll have to train so to put it on by yourself. Very often, for convenience of putting the corset on by yourself, a special hook-and-eye tape is made in front.